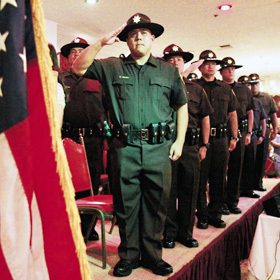 ISLAND IMAGES » The 25 graduating members of the 13th Law Enforcement Recruit Class of the Department of Public Safety saluted the American flag last night during ceremonies at the Queen Kapiolani Hotel. A Kaneohe Marine's death on patrol becomes a war milestone. Talks with nurses end; action could be taken next week. The refusal of city workers to collect some green-waste bins angers a neighborhood. An interfaith program offers homeless families the tools they need to get back on their feet. For one day, the 15-year old Moanalua student shoots better than some of the world's best. Those receiving notices were mostly part-timers who knew they were going to be let go. An appeals court must reconsider its decision allowing taxpayers to challenge state expenditures on Hawaiian programs.